On Monday I gave you the run down on my plans for a few new features for Kitchen Concoctions for the year 2012. One of them was changing the Magazine of the Month series to a (food) Website of the Month series. This will entail featuring a different food/recipe/meal planing website each month of the year 2012. I will be sharing that week’s selected recipe on Wednesdays for “Website Wednesday”. A natural choice for my first website feature of course had to be meal planning/recipe site Food on the Table. Since I already know a lot about this website (since I do freelance work for them) and already develop and test a lot of their recipes this was a natural first choice. I am still trying to narrow down the other recipe sites I would like to review. On the list so far: Tasty Kitchen, All Recipes, Recipes.com and a few more. If you have any recipe websites that are your favorites please share! Anyways, today’s recipe is so tasty. 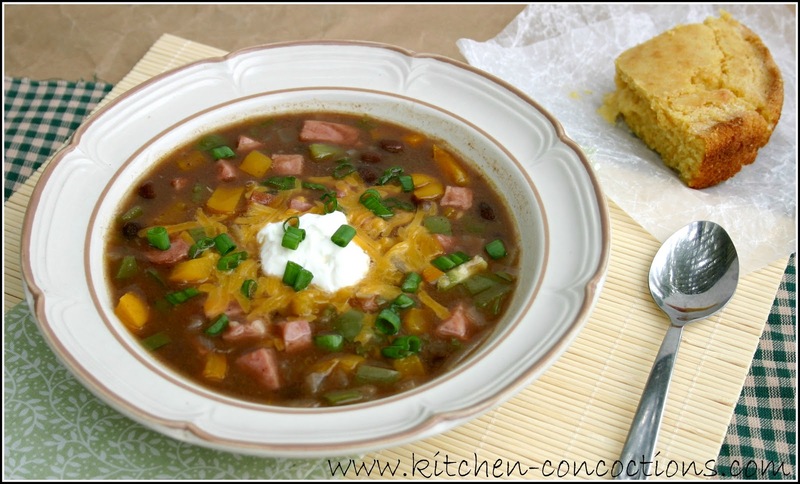 A hearty black bean soup with sweet ham, bell peppers, smoky cumin and a bit of a spice from chili powder and jalapenos. And if you have any ham left in your freezer from Christmas this is the perfect soup to use it in, if not a small ham steak should suffice. 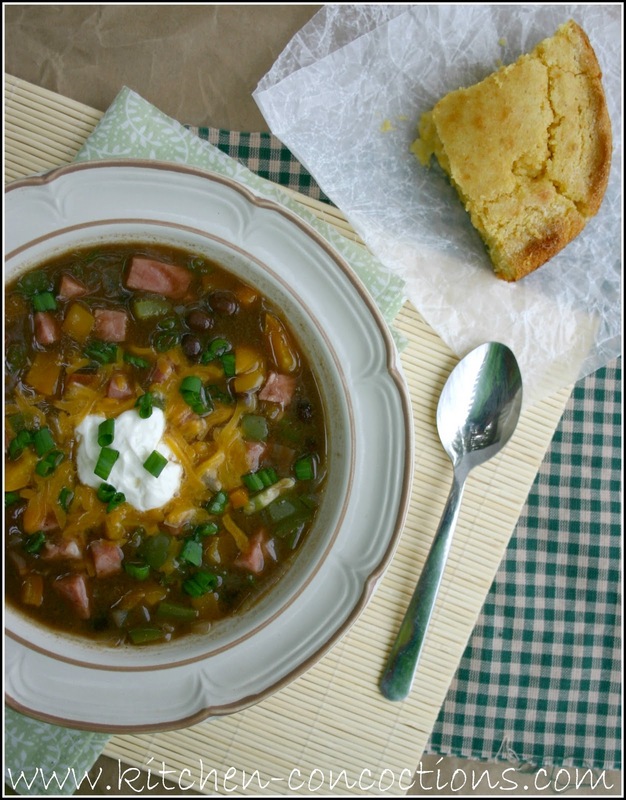 Serve with a side of cornbread and you have a recipe that is a keeper! Heat the oil in a large pot over medium heat. Stir in the onion, bell peppers, jalapeno, and garlic, and cook 5 minutes, until tender. Mix in 1 can black beans and chicken broth. In a blender, puree remaining can of beans until smooth. Mix into the pot. Bring soup to a boil. Reduce heat to low. Mix in ham, cumin, chili powder, salt, and pepper. Simmer 20 minutes. Garnish with desired amount of cheddar cheese and sour cream to serve. Disclosure: Again I am not being paid to do these reviews, I just frequent these sites a lot and wanted to feature some recipes I get from these sites and sort of compare the different features these websites have to offer. I love this idea and I'm looking forward to the sites you review! I actually do have some ham on hand right now, and this soup sounds so perfect.